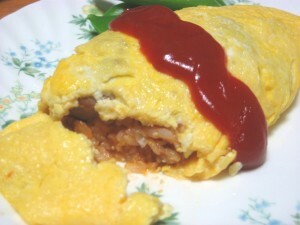 Omelet rice is a food which fried rice with chicken and tomato ketchup is wrapped by omelet. 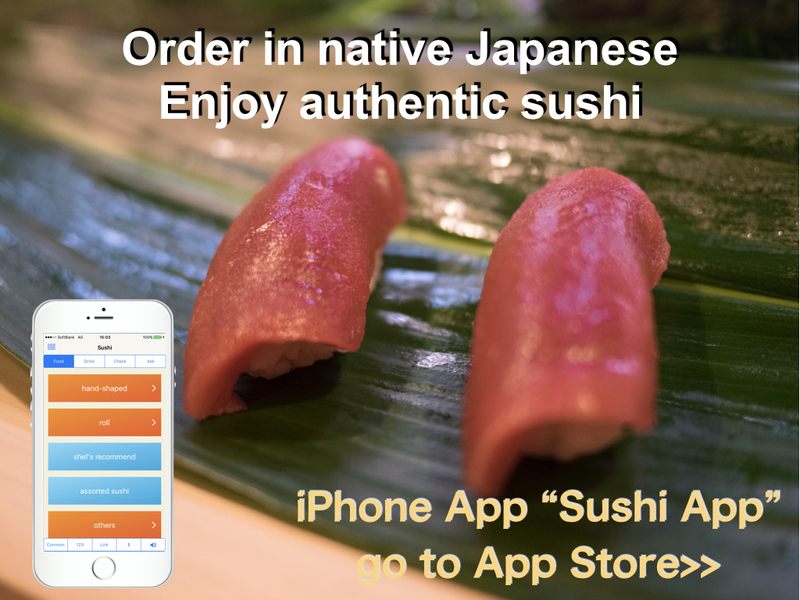 It is a kind of yoshoku, one category of Japanese foods. 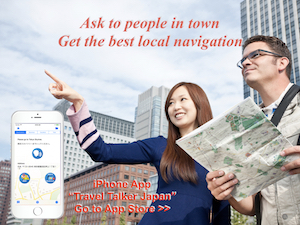 However yoshoku’s roots is Europe or American foods, they are developed in Japan as original Japanese foods. Omelet rice is very popular home food and also served at restaurants. The fried rice with chicken and tomato ketchup is called as “Chicken Rice” and served as it is. 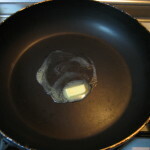 2) Place butter on a fry pan and heat it on small heat with some sea salt and pepper. 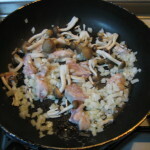 Put chicken, onion and mushroom in a fry pan and heat until onion becomes light brown. 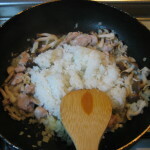 3) Add rice in a fry pan and combine with others. Then add tomato ketchup and consomme soup stock. 4) Make omelet in another fry pan. I add 5g butter at this time. 5) On half way of making omelet, place “chicken rice” on the egg and wrap rice by egg. 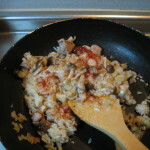 6) Place omelet rice on a dish to make cover by fry pan. 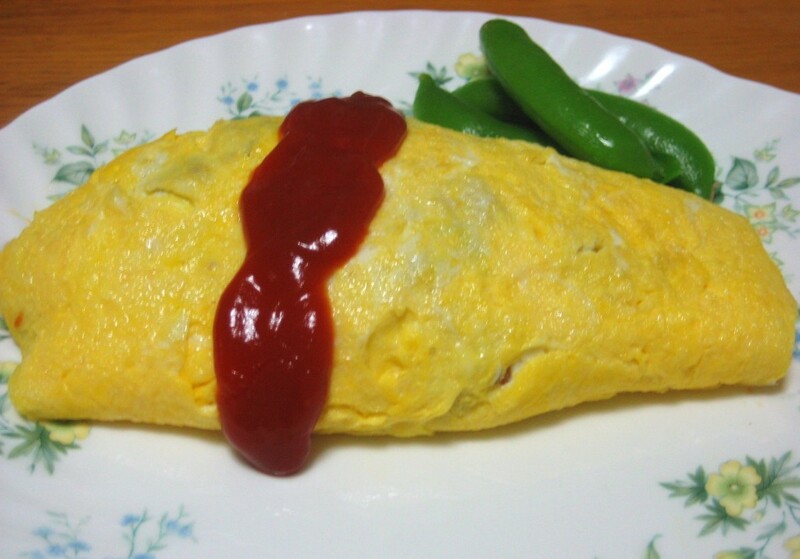 7) Pour tomato ketchup on omelet. 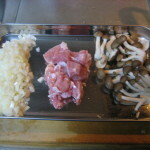 Basic cooking method is same, but there some different type of omelet rice. I poured tomato ketchup on omelet at this time. Some people pour demi-glace sauce or bechamel sauce. Also I warpped chicken rice by omelet. 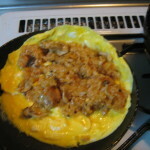 Another way is place soft baked omelet on the rice, then cut the skin of omelet. Rice is our staple food. I think old Japanese people (around 1900) developed omelet rice to combine rice and European foods.